Holiday Cake Pans Available for the Holiday Season! 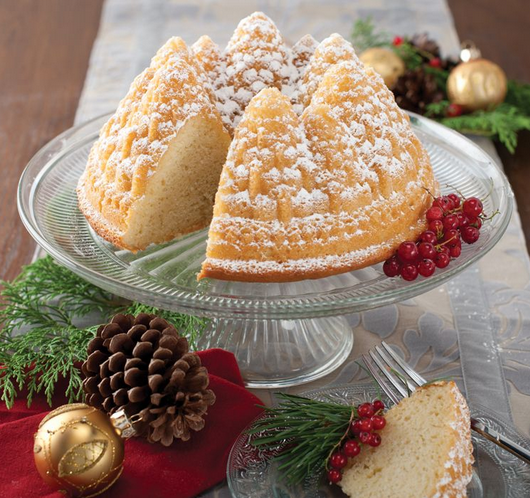 Amaze your guests or hostess this holiday season with our wide array of tactile Nordicware cake and loaf pans. Bundt pans, cake pans and loaf pans are available from our Gadget Gallery. Image: Pine Forest Bundt cake on crystal footed platter. Cake shown is a pound cake dusted with powdered sugar. A slice from the cake is on a crystal plate next to the platter. Cake is embellished with red berries and pine sprigs. Table-scape consists of a pine sprig, a pine cone and gold glass ornament on a red napkin.